Wrinkles and volume loss are some of the most common signs of facial aging. As people age, their skin naturally produces less collagen and elastin, resulting in fine lines, loose skin, and hollows in the temples, cheeks, and under eyes. Philip J. Miller, MD, FACS offers a wide range of minimally-invasive solutions to wrinkles and volume loss, such as injectable neuromodulators and dermal fillers. Contact Dr. Miller and his team of skin specialists in New York to learn about the latest and most effective wrinkle treatments. Utilizing various injectables, Dr. Miller can restore facial volume, reduce deep wrinkles, and help rejuvenate and lift the face. Unlike popular fillers or “volume” treatments such as Radiesse, Restylane, or Juvéderm that boost or inflate an area where there is a wrinkle or depression, Botox relaxes the muscles pulling on the skin to form the wrinkle. Botox is superior to dermal fillers for minimizing frown lines, horizontal furrows on the forehead known as surprise lines, and crow’s feet around the eyes. It can also be used around the lips, on either side of the nose, or on the bands of the neck. Other advantages of Botox are that it causes no allergic reactions so no test dose is required, and there is no recovery period required after the injection. Finally, those with needle anxiety can relax because the needle used for Botox injections is finer than a strand of hair. Dermal Fillers: Restylane, Radiesse, Juvéderm. The reality is that not every skin problem can be improved with facial plastic surgery, chemical or laser peels, or even Botox. Examples of these skin problems could be the following: (1) The crease between your eyebrows or the furrow formed at the corner of your mouth is too deep; (2) You might have a small crease between the corner of your mouth and chin (known as the jowls) causing you to look angry all of the time, or (3) You might have persistent frown lines or crow’s feet that cannot be resolved with Botox. While certain operations may improve these, the recovery time and expense may be more than you are willing to invest at this point. A reasonable alternative is to “inflate” a depressed or wrinkled area with a dermal filler. There are pros and cons to each volume enhancer. Which one is right for you? Here is a brief introduction to the products. 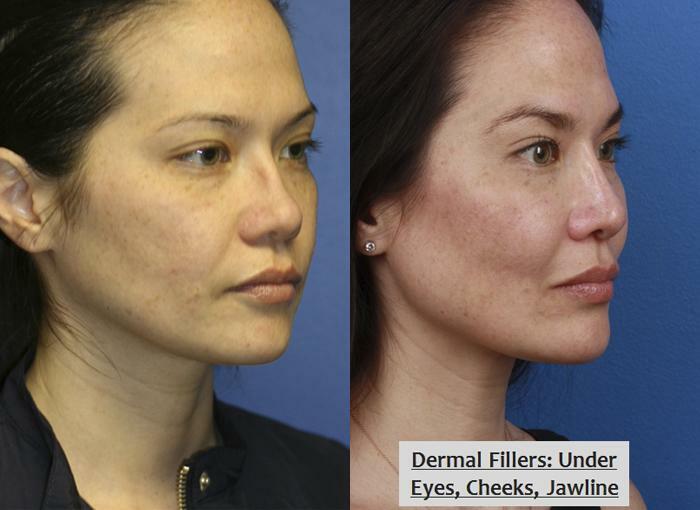 Radiesse is a longer lasting method to reduce the appearance of facial lines and folds. The injectable product can last for a year or so and has shown little to no allergic reactions or other side effects attributed to other injectable methods. One of the most recent FDA-approved products for the treatment of facial “deflation” or wrinkle reduction, Radiesse consists of calcium hydroxylapatite (a derivative of human bone) mixed into an easy-to-use-gel foam. Studies have shown that Radiesse remains soft for long periods of time when injected into the soft facial tissue. This is the preferred treatment for nasolabial lines, which are the wrinkles or furrows that form from the side of the nose to the side of the mouth. Known as the most common injectables, Restylane and Juvéderm, last 6-8 months. They are made of a purified form of hyaluronic acid, a material that is naturally found in the body. Restylane and Juvéderm work well for lip enhancement and as brow and fine wrinkle solutions. Sagging skin is not the only consequence of aging. 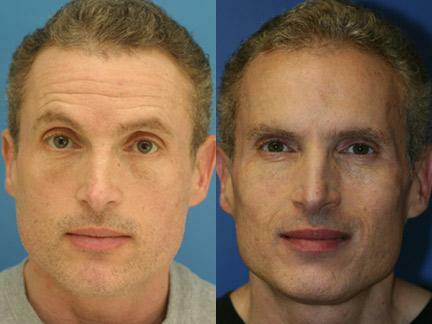 Not only does facial skin sag with time, but facial fat also deflates similar to a balloon stuck with a pin. 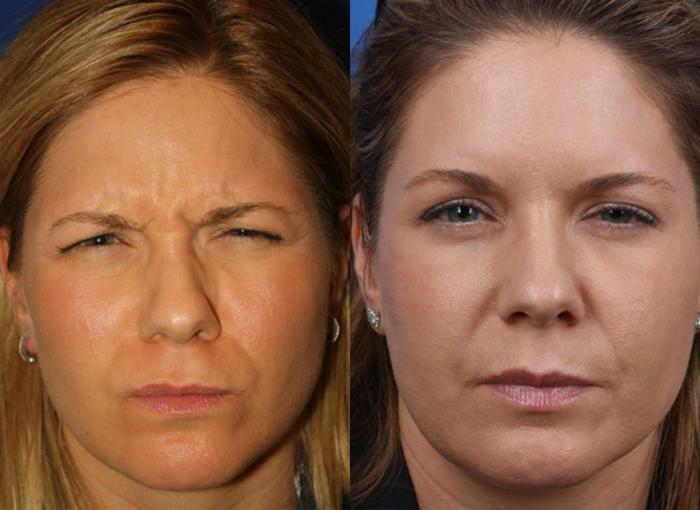 Before realizing the role of deflation in the aging process, we’ve done facelifts to pull the loose skin. Sometimes the results are good, but sometimes the skin looks stretched and unnatural. Two solutions to the deflation problem are Sculptra and fat injections. Sculptra works much like a seed. After it is injected, it looks great for a day. Then, the volume goes down by the next morning. Over the next weeks or months, your body stimulates collagen volume in response to those “seeds.” The result is a gradual and increased inflation of depressed or hollow areas. 2 or 3 treatments are often necessary. Sculptra contains poly-L-lactic acid and is injected into the face after it has been anesthetized with a cream. Fat injections use your own fat from the inside or outside of your leg or your belly to provide volume enhancement to the face. Fat is harvested, washed with saline, and reinjected into the areas of the face that need inflation. There is some controversy regarding how long transplanted fat survives. As a result, you should be prepared to received multiple treatments. Also, fat injections produce the best results when combined with surgical procedures; they cannot be used alone to cure all facial aging problems. Specifically designed for patients suffering from rosacea and other skin discolorations, Intense Pulse Light Therapy (IPL) or ProLight Facial technology helps eliminate redness and pigmentation discolorations from sun damage. The treatment is performed by a gentle light pulse that is delivered to the skin over several 15 to 30-minute treatments which are administered in three-week intervals. Between 4 and 6 treatments are necessary to achieve desired results. Diminished (or disappearing) redness, dark spots, and discolorations occur as well as reduced pore size. Equally beneficial is that little or no bruising occurs with this treatment, and there is no recovery period. Visit Our GalleryNext, read about Juvéderm.